Always looking for a meal. At dusk, Platypus leaves his sandy burrow and dives into the cool green pool. It is time for him to hunt and forage. As he dives, floats and swim, readers are taken along on his evening outing, all the way learning about this unqiue Australian animal. Alongside the story of this one platypus, there are platypus facts including physical features, diet, habitat and more. The gentle text is informative, but is also poetic, with the feel of the nighttime meanderings. This is reinforced in the dusky colours of the mixed media illustrations. The platypus is realistically rendered, which makes him all the more endearing. Part of Walker Books’ amazing Nature Storybooks series, Platypus is suitable for private enjoyment as well as classroom use. Avalable from good bookstores and online. First published in 1944, the tale has been published in many editions since and sold hundreds of thousands of copies. It has now been brought back to life in a delightful hard cover illustrated edition by the National Library of Australia. Shy the Platypus is a classic tale of the life cycle of the platypus, told through the fictionalised story of one specific platypus, named Shy. First published in 1944, the tale has been published in many editions since and sold hundreds of thousands of copies. It has now been brought back to life in a delightful hard cover illustrated edition by the National Library of Australia. Author Leslie Rees wrote very Australian books for children at a time when there were few such offerings, with his series of books on Australian animals introducing readers in Australia and overseas to our unique wildlife. Special in this new edition is the use of illustrations and photographs from the library’s collection, along with an introduction by one of Leslie Rees’ daughters. Dymphna Rees Peterson. 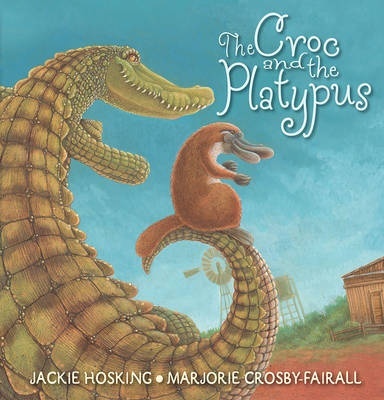 In hardcover format with black and white and colour illustrations in a variety of styles, the book also includes photographs, samples of Rees’ drafts and proofs, and back of book information about the platypus, making it both a collector’s item and a suitable offering for children. Lovely. Having recently met the author, and having seen much of her work collected together, the abiding regard she holds for Australia’s native wildlife became vividly apparent. Along with many talented artists, Jill has brought the bush to young readers with such characters as golden wombats, fig parrots, crocodiles, geckos and platypuses. In this she could be compared favourably with another Queenslander, Narelle Oliver. Platypus Deep follows Orni the platypus as he searches for a deeper home. It is this search that shows both platypus and reader how important the creek system has been to many animals over millions of years. Orni’s journey visits the familiar imagery of Jill’s books – native animals facing nature while living in a world dominated by humans. The author lives in Maleny where non-fictional platypuses have recently experienced the disruption of human intervention. A reading of this lyrical narrative suggests a quiet creek setting with just the trickle of a waterfall and FLIP FLOP of Orni’s flippers to rustle the peace. A carefully measured repetition of sounds and the appearance of echidna hunting for ants leads to a beautifully balanced book. It is hoped that Platypus Deep will continue to introduce this curious animal to children, and not be the only remaining evidence of its existence.